We take the finest hybrid popcorn to ensure we have large popped kernels, and pop them in 100% coconut oil and just the right amount of pure sugar to give you that sweet kettle cooked taste. 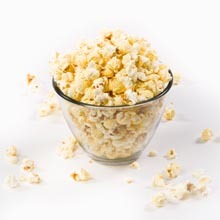 Then we lightly sprinkle the popped corn with sea salt to give you the flavor explosion you've been looking for in all kettle corn! This is just like the old fashion kettle corn you find at the fairgrounds, not too sweet just the perfect amount.